I realize, like most of my modern audio contemporaries, I have ironically spend most of my auditory existence staring into a screen. I also realize that I am reluctant to create in programs or plugins that amplify the feeling that I am, indeed, staring at a screen. Certain plugin designs, or the uninspired sounds they can produce sometimes seem to amplify my conflicted relationship with working “in the box”. I have spent much of my session work life experimenting with audio plugin’s of all shapes, layouts, and cost while attempting to fit it into my work flow. At the end of the day, It comes down to searching for my toolbox that I can rely on when I am in a bind, or more importantly when I need to be creative. Note: all plugins listed below are available for both Mac and PC. This may be the most Important tool in my audio arsenal, but this plugin is probably not for the fiscally responsible. This powerhouse of a program, (oh, sure, start out with the $1200 dollar plugin.) has brought me to new heights as an audio engineer both practically and creatively. It has an uncanny ability to save my audio files when recording in unforgiving environments, or when unforeseen technical issues rear their ugly head(s). It can help me trim the fat off all but what I exactly want from a sound with laser precision. This self proclaimed “audio repair” program also has some powerful features that can be used to create some wide range of audio textures, so it should not be underestimated as a one trick pony. Adding a spectrogram into my workflow when working with recordings, or trying to problem solve noise issues has been an essential time saver. 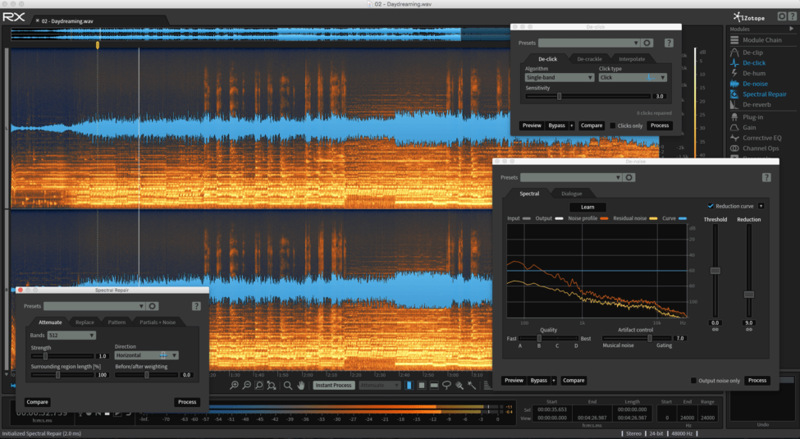 The visualization tool that blends between a standard wavelength and the spectrogram has also really helped me evolve as an audio engineer by helping me understand the deeper story of what exactly what the sound is doing over time. You can also very selectively crank up a specific audio removal features to achieve unexpected textures and bizarre sounds. Time stretch, De-Verb, and selective De-Noise are some features that come to mind that can completely change the perception of the original sound. The integration with Logic X makes it perfect for my work flow as Logic is my current preferred DAW right now. After some simple setup in Logic, one key command later( Shift-W) and I am immediately bouncing between Logic and working in RX5 during my session. Recommended User: Anyone working as a sound recordist, audio engineers working in media , producers that sample using many different sound sources, video game sound designers, audio engineers working in audio restoration. The synth plugin to end all synth plugins, just remember to hit the damn “record” button once and awhile. I am not going to lie, the learning curve on this piece of software can be quite daunting if you are new to the world of synthesizers. That being said, with a little patience, education, experimentation, and overall inherent need to make bizarre sounds, this system can change the way you feel about making music with a laptop. Reaktor 6 is an long awaited update from Reaktor 5 that brings ease of use, flexibility, and an intuitive GUI on an ever evolving playing field. This is hands down the program to learn if you have any interest in subtractive synthesis, modular synths, FM or additive synthesis, how control voltages work, or effective uses of modulation when creating sounds. It’s fun to experiment with this highly intuitive interface. The “help view” function will explain every module, every connection, and give explain general uses for each module when you are scratching your head and trying to create your first patch. This update from Reaktor 5’s more confusing and programmer focused layout, is a welcomed change for the working musician that also includes backwards compatibility with your old Reaktor 5 instrument library. There is literally endless possibilities when creating sounds and textures. With the addition of the huge User Library on Native Instruments website, you get even more ever-changing options available to experiment with. 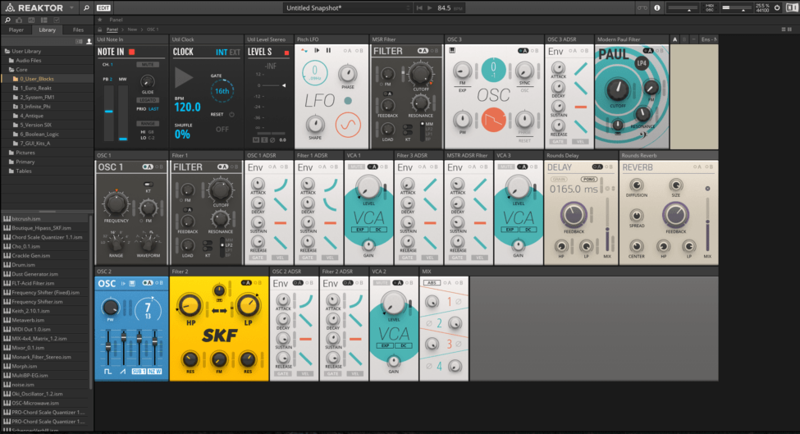 The oscillators and filters emulated within Reaktor sound fantastic, though you should have a powerful enough machine at your fingertips to fully enjoy the stable benefits of it. What you create is entirely unique! In a world where the average producer swims through oceans of presets, this brings you back to raw sound fundamentals, and challenges you to do something unique. Again, Remember to hit the damn record button once and awhile! You can easily “chase the dragon” for that perfect sound, so remind yourself that experiments are great, but finished work that people get to actually hear is always better. Recommended User: Synth-heads, sound designers, video game audio designers, curious musicians, programmers-turned musicians, musicians who played with legos or Construx as children. Finally, a mix collection featuring an 1176 Compressor plugin that doesn’t sound like it was ran through a washing machine. I think most audio engineers or music producers will have experienced recording or mixing music with a compressor, namely the infamous 1176 compressor. I have spent many hours working with versions of this compressor, from real analog units, to “Bomb Factories” to unauthorised reproductions. I gotta say, until now, I have never enjoyed working with anything but the real analog unit. Slate changed that for me and just nailed the 1176 emulation in this affordable mix bundle that also includes some of the most useful EQ’s, compressors, saturators, and harmonic exciters I have used in years. The EQ’s are musical and have a ton of character. The individual units are versatile with both electronic and acoustically recorded sounds. The compressors add “life” and “feel” to performances and to mixes in a way that I have not really felt with other emulations. The lay out, sound quality, and ease of use actually make it a fun experience, it never feels “clinical” to me. The overall sound of this virtual rack seems to be extremely clean when you want it, dirty when you need it to be, and will give you a feeling of “headroom” that Is hard to explain and just amazing coming from a plugin. The amazingly affordable monthly plan adds on every Slate plugin available, and includes any future plugin releases that will automatically update as you go. I have no idea what the “Revival” unit is supposed to be an emulation of, but it sounds great on practically everything. Recommended User: Pretty much anybody involved in one aspect of audio engineering or another, you will use this daily. The Germans are at it again, thank the maker. Urs Heckman, the modern day plug-in creative genius who gave music producers and sound designers around the world some of the most useful plugin synths around, (i.e. 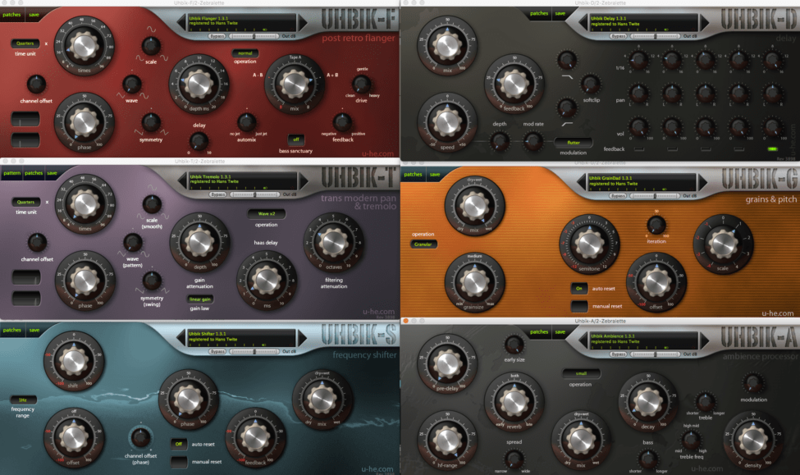 Diva, Zebra 2, Bazille, and Hive), also happened to give us one of the most fun effects bundles around with Uhbik. The interface and design with these effects units is unconventional and unique, giving you a fresh perspective on old classics, and seems to push you to use your ears, instead of just your eyes while making music. Thankfully, this plugin is not just an exercise of form over function, these powerful units give new life and creativity to your sound in unexpected ways. The fresh interpretation of the standard effect controls in a plugin make using these units a unique experience, something that is surprisingly hard to come by these days from larger plugin companies. The quality of the sound and dramatic range of tonal capability make these ridiculously powerful when you stack them on top of eachother. The delay unit has a sequencer that makes creating movement and spatial variability a breeze, but you can really go down the rabbit hole with detail if you want to as well. With a flood of convolution reverb plugins available, having a very useful algorithmic reverb has really given me dimensionality options, with my mixes. The pitch shifter/ granulator makes insane sounds that tends to freak my cat out, which is my barometer that tells me I must be on the right track as a sound designer. Recommended User: Guitarists who are bored with their pedal board but don’t want to spend $500 to experiment with new sounds, sound designers, character voice over artists, video game audio, music producers of all shapes and sizes. Artificial double tracking or “ADT”, is something you have heard more times then you realize. Originally created by Ken Townsend during his time recording the Beatles at Abbey Road Studios, ADT was originally created as a time saver to imitate the effect of an overdubbed vocal performance. Using his inherent math skills and ingenuity, Ken created a hardware unit that created a whole new way to process sound single sound sources. Even now, this plug in version allows for some unique territories in sonic spatial placement and creates some serious “Vibe” in your mixes. You can add interesting dimensionality to mono sound sources by panning the delayed signal into other areas of the stereo field creating unique sound placement. The LFO modulator adds a tape “warble” effect that can created all sorts of unique phasing and textural changes. . In combination with other plugins’ it can create whole new environments and spatial placement of sounds. This plugin doesn’t seem to “squash” or “kill” the sound like so many other stereo effects can. Ok, I admit it, I love John and Paul too! (….and Ringo) you can really get down on vocals with this thing. It makes tracking vocals easier as well when you don’t always have to rely on reverb or traditional delay to make your singer feel at home when they are getting into their performance. Recommended Users: Beatles cover bands who are finally going to the studio to record their own “Admiral Spice..”, Producers who love the sound of mono drums in mixes but like variety, producers who record a lot of vocals, sound designers, music historians, guitarists who record in their closet but want that “huge” sound. Well, there you have it, I just gave you an excuse to spend more money. Also, always remember that you can comfortably make amazing records or sounds with the tools that come stock with your DAW. It’s not the tools that get the job done, it the intention behind them. 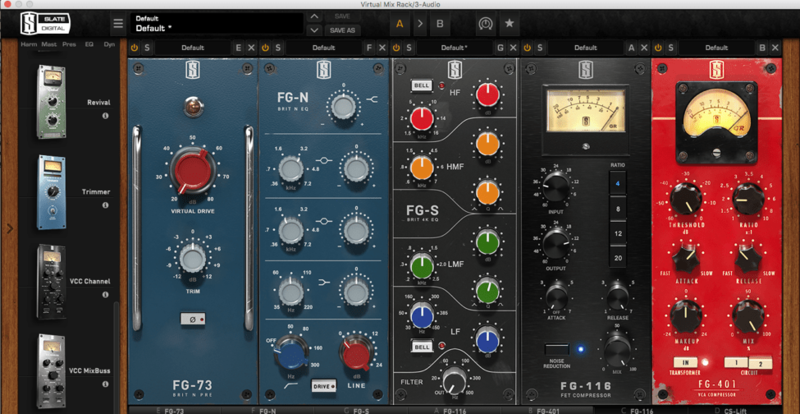 I would say, of any of the options, the Virtual Mix rack from Slate that is included with the everything bundle seems to be the greatest value for the working audio engineer. U-he also allows you to download demos of Uhbik as well as the rest of their incredible library for free to hear the sounds for yourself. Tune in next round for more recommendations, in the meantime feel free to hit me up on twitter or instagram to share your favorite toolbox.